The Debtor is based in Dallas, Texas. The largest creditor is listed as Caterpillar Financial Services with a disputed $12.7 million claim. Sign up for our case notification service now! Contact Ken at ktroubh@nationwideresearch.com for details. Debtor Name: Maguire Group Inc. The Debtor is represented by Berger Singerman, P.A. The largest unsecured creditor is the State of Connecticut with an approximate $15 million claim. 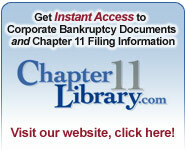 Check out our new chapter 11 creditor alert services! Our daily creditor alert provides you with a customized report of cases involving companies that matter to you, as either debtor or creditor. Contact Fowler at fstorms@nationwideresearch.com or 415-773-1230 to learn more. The petition lists Trust One Bank of Memphis as the largest unsecured creditor with an approximate $2.1 claim.